Update your space with elegant and functional furnishings like this 2-Drawer Nightstand. Place the South Shore Country Poetry 1 Drawer Nightstand next to her bed to store essentials in charming country style. Easy assembly. Constructed of Medium Density Fiberboard (MDF) and Particle Board. Lifetime warranty on all hardware and 5 year limited warranty on product. Ships ready-to-assemble. Overall Dimensions are 26.5in H x 23.75in W x 17.938in D. Three drawers on metal glides for storage. Size: 18 In. (W) x 13 In. (D) x 23 In.(H). Size: 20 In. x 13 In. x 28 In. Chest Of Drawers. This Chest Has Three Drawers And It Is Easy To Assemble. Strong Construction. Dimensions: 25.5W. X 15.5D. X 27.5H..
Nouvelle Night Stand A perfect bedside addition. The bottom shelf is great for books, magazines or even your stereo. Clean, crisp lines, with perfect lateral and horizontal balance Solid corner leg posts up to 2 inches thick Open back assures easy access for power cords One drawer: 15.75 In.W x 12.75 In.D x 3.75 In.H Crafted from durable, stain resistant, laminated wood composites, that includes MDF Assembly required Made in the USA Materials: Laminated Wood Composites/MDF Available in Pine, Cherry, Black or White Finish. Everyone needs storage space. These chests are the perfect affordable, stylish solution. Beefy looking solid 2 In. thick legs add style as well as strength. Real bead-board panels provide the latest look in fashionable furniture. The simple design assures that they will blend well in any room in the home especially the bedroom. 3027 Features: Constructed from durable melamine laminated particle board Full height (5 In.) drawer sides Easy glide drawer guides and roomy insides Light and strong Solid leg supports Beadboard side panels Solid metal cup handles Easy to clean Made in the USA Assembly required Available in Walnut, Cherry, Black, White and Oak Finishes. Dimensions: 28+ In. (W) x 16 In. (D) x 24+ In. (H) Item Weight: Approximately 45 lbs. Solid Wood Harlington Collection Case Goods. Minimum Assembly Required. Strong Construction. Available in Java, Natural and Chesapeake (Cherry) Finishes. See image for sizes. Drawer Mobile Carts are a perfect add on, especially if you need extra storage. Yes, they too are mobile. 4047 Features: Constructed from durable melamine laminated particle board 5 Roomy drawers Casters add mobility Durable, easy to clean Bead-board panels Stain resistant Easy to clean Matches mobile desk 1017 (Sold separately) Made in the USA Assembly required Finish: Black, White and Oak. Dimensions: 18 In. (W) x 18 In. (D) x 29 In. (H) Item Weight: Approximately 50 lbs. Accent your bedroom with our sophisticated Coal Harbor Tall 3 Drawer Nightstand. Finished in sleek black or rich espresso laminates, this night stand offers 3 inset drawers, two full-size and one shallow, each with a trendy, 6 In. long rectangular handle in matte metal. The night stands MDF top has been finished with bevelled edges, while the base features angled cut-outs, enhancing the clean, contemporary style. This slender piece will be right at home at any bedside: at 20-1/2 In. wide, it is the perfect storage solution for small spaces. This product ships Ready to Assemble and includes an instruction booklet for easy assembly. Nightstand in Solid Pine Wood. Available in Honey Pine and Natural.Strong Construction. Size: 21W x 18D x 21H. Monterey And Sonoma Collection Tall 2-Drawer Nightstand. This Stylish Tall Nightstand Features An Open Shelf That Is Perfect For Bedside Reading Material. Other Features Include Two Drawers That Run On Smooth, All-Metal Roller Glides With Built-in Safety Stops, A Profiled Top, Arched Kick Plate. Strong Construction. Easy To Assemble. Available In Cherry, White, Black And Maple Finish. Monterey Collection: Includes Cherry And White Finish With Dark Pewter Finished Solid Metal Knobs. Sonoma Collection: Includes Black And Maple Finish With Solid Brushed Nickel Knobs. Size: 23 1/4 In. (W) x 16 In. (D) x 28 In. (H) Weight: 47lbs. See Related Items Below. Strong Wood Nightstand. Light Cherry Finish.Dimensions: 21In. x 17In. x 18In. Monterey And Sonoma Collection 2-Drawer Nightstand. This Stylish Nightstand Features A Profiled Top, Side Moldings And An Arched Kick Plate. The Two Drawers Have Dark Pewter Finished Solid Metal Knobs And Run On Smooth, All-Metal Roller Glides With Built-In Safety Stops. Strong Construction. Easy To Assemble. Available In Four Colors. Monterey Collection: Includes Cherry And White Finish With Dark Pewter Finished Solid Metal Knobs. Sonoma Collection: Includes Black And Maple Finish With Solid Brushed Nickel Knobs. Size: 23 1/4 In. (W) x 16 In. (D) x 21 3/4 In. (H)Weight: 37lbs. See Related Items Below. 2-Drawer Nightstand With Laminate. Available in Black, Cherry and Natural. Strong Construction. Easy to assemble. Size: 21 In. (W) x 20-3/16 In. (H) x 17-5/16 In.(D). 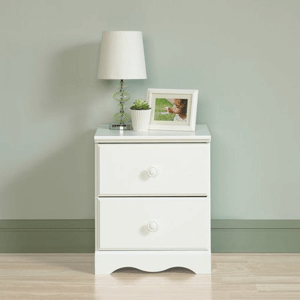 Aura Night Stand 5512 (ML). Features Stylish Metal Night Stand With A Touch of Wood. Check Related Items for Matching Bed. Willow Night Stand. Features Glass Top and Shelf in Black Finish. Check Related Items For Bed In Willow Style. Metal Night Stand With Treliss Design In Vlack Textured Finish. Check Related Items For Canasta Furniture Collection. 3-Drawers Solid Pine Wood Night Stand. Strong construction. Easy to assemble. Available in Natural, Honey Pine, And Golden Oak Finish. Size: 21 In. (W) x 25 In. (H) x 18 In.(D). • Color: Multi • Size: 26 In.H x 24 In.W x 19 In.D • This unique bedroom set features the fun look of lockers! • Great for kids and teens! • Each piece is sold separately! Please scroll to the bottom of the page to see more locker style products. This Simple And Sleek Nightstand Features One Drawer And An Open Area For Books, Baskets Or Even Slippers. Ideal For Any Bedroom. Sides, Top, Drawere Fronts And Kickers Are Made From 5/8 In. Thick Laminated Board. The Drawer Components Are A Medium Density Fiberboard (MDF) And Slide Smoothly On Nylon Glides With Built-In Safety Stops. Drawers Can Be Easily Removed For Cleaning Or Moving. Available In Three Colors: Black, Oak And White Finishes. Oak And White Finishes Have One Round Knob And Black Finish Has A Contemporary u Shaped Pull. Strong Construction. Easy To Assemble. 20 In. (W) x 16 In. (D) x 19 3/4 In. (H) Weight: 27lbs. Alder Finish Night Stand made of MDF. Very strong construction. Comes ready to assemble. See matching pieces below.Size: W17,7 In. H27,1 In. D15,9 In.